Since its introduction in 1995, Canada’s long-gun registry has been a high-profile political issue. This stems, in large part, to philosophical differences on gun control policy between and among Canada’s political parties, and issues relating to the cost of the program. This article provides an overview of the history, operation, and debates surrounding the long gun registry. It includes an overall discussion on gun control policy and approaches, a brief history of gun control in Canada, a section dedicated to the history and operation of the long-gun registry (including the movement to abolish the program), and arguments for and against the registry. Valuable instrument for law enforcement or an expensive and ineffective program? One might be tempted to view gun control policy as simply a question of whether the government should regulate the ownership and operation of firearms. In this context, one might identify two basic positions. There is the laissez-faire approach, which holds that the government should not interfere in an individual’s ability to bear arms. Such a position would frown upon any attempts by government to regulate one’s possession of firearms. In contrast, there is the restrictive approach, which holds that government should tightly regulate the ownership and operation of firearms. In its most extreme form, an advocate of this position may go so far as to suggest a complete prohibition on gun ownership. In practice, however, gun control policy is rarely ever framed in these extreme terms. Most western countries permit citizens to own and use firearms, be it for sporting activities, recreation, hunting or collection. Nevertheless, governments still impose regulations on the use of firearms. Though most gun advocacy groups recognize that some government regulation is desirable, in the US, for example, the National Rifle Association (NRA) is one of the most outspoken groups in North America against strict gun control. Nevertheless, even the NRA recognizes that some government intervention, such as prohibiting the possession of firearms by certain groups (such as convicted criminals), prohibiting the sale of firearms to juveniles, and the requirement of criminal record checks when purchasing a firearm, is necessary (National Rifle Association, 2006). As such, the debate on gun control policy tends to centre not on the question of whether firearms should be regulated, but the sorts of regulations that should be imposed and to what extent. In the context of the Canadian long-gun registry, for example, the debate is not whether the government should regulate ownership and use of rifles and shotguns. Most opponents of the long-gun registry advocate a strong licencing system, background checks, and even registration of handguns. The debate, instead, focuses on whether the registration of rifles and shotguns is necessary to control firearms. Within this basic framework, a number of different types of firearm regulations can be identified. It’s important to note that many countries, including Canada, employ multiple types of restrictions in their overall approach to gun control. See the History of Gun Control Policy in Canada section of this article for more information on the Canadian approach to gun control. A common type of restriction is a restriction on who may possess a firearm. Under this type of restriction, certain classes of people are prohibited from owning a firearm, such as individuals convicted of a serious criminal offence. The concern underlying this particular restriction is that such individuals pose a risk to public safety and thus should not be permitted to possess dangerous weapons. Another type of restriction is the restriction on the possession of certain types of firearms. These sorts of restrictions target the gun, rather than the gun owner, prohibiting possession of certain classes of firearms. A common example would be prohibitions on the ownership and possession of military-style assault weapons. These restrictions are often based on the argument that assault weapons are not necessary for hunting or recreation, but pose a high risk to public safety due to their lethal nature. A third type of restriction centres on the use and operation of a firearm. This restriction sets out certain types of conduct that must be followed if one is to possess a firearm. Common examples would include rules regarding the storage and transportation of firearms and restrictions on where/when an individual may carry and discharge his/her gun. The general intent of these sorts of restrictions is to encourage the safe operation of firearms, and to discourage the use of firearms in illegal activities (such as theft or smuggling). A final type of restriction involves licensing and registration. With licensing, individuals must apply for permits in order to purchase and/or operate a firearm. In some cases, persons must provide certain minimal personal information and meet certain requirements to receive a license. In Canada, for example, to purchase a firearm, individuals must first pass a firearms safety exam prior to attaining a license. In addition to licensing, some jurisdictions also require that firearms be registered. Under a registration policy, the government maintains a list of legal gun owners and their firearms. Registration lists can then be accessed by law enforcement and security agencies. Canada has over 100 years of gun control legislation. It is important to note that the federal government has tended to take the lead in developing gun control policy, and does so through its constitutional jurisdiction over criminal law. Accordingly, Canada’s gun control legislation has largely been implemented through the Canadian Criminal Code, with violators of firearm laws being prosecuted through Canada’s criminal legal system. Beginning in the late 1800s, the federal government prohibited certain types of conduct relating to firearms. Examples included possessing an offensive weapon for any purpose dangerous to the public peace; carrying an offensive weapon while committing a criminal offense; and carrying a firearm while masked or disguised. Beyond these limited measures, however, there was very little in the way of firearm restrictions (Friedland, 1975). Persons were free to own and sell firearms without licenses or registration. The exception was an early law with required persons in the Northwest Territories to gain the permission of the Lieutenant Governor in order to possess or sell a firearm. In 1892, the federal government introduced the first nationwide permit system. The scheme dealt only with small arms, required that persons have a certificate to carry a pistol outside their home or place of business, and imposed only a small fine for violations. In 1913, this system was further strengthened when permits were also required to purchase small arms and the penalty for violations was raised to a maximum of three months’ imprisonment. Beginning in 1919, the federal government introduced a series of tighter restrictions on firearms. This was due, in part, to the violence associated with the 1919 Winnipeg General Strike (Friedland, 1975). The 1919 legislation required those of foreign origins in Canada to possess a permit to carry any firearm. This stipulation was imposed on suspicions that foreign citizens were central agitators in the strike. In 1920, the federal government introduced even stricter gun control legislation. Under the new system, all persons — Canadians or otherwise — were required to obtain a permit for all firearms, including small arms, rifles, and shotguns. A year later, however, the federal government reversed its position, reverting to the 1919 position, requiring only those with foreign roots to have a permit for all guns, while Canadians were only required to obtain a permit to carry small arms outside their homes or places of business. The Government of Canada did, however, introduce a provision allowing it to require permits for all guns for temporary periods in specific geographical areas. This provision would allow the government to deal with isolated crises, such as the Winnipeg General Strike. In the 1930s, the federal government again introduced tighter firearms regulations. These reforms were intended to cope with the rise of violent gangsterism in North America associated with prohibition and anti-gambling laws of the period; they were also influenced by proposals for tighter gun control in the neighbouring United States (Friedland, 1975). Central to these reforms was the notion of strengthening the permit system. Stiffer penalties were imposed for carrying a firearm outside one’s house or place of business without a permit, with imprisonment terms changing from a maximum of three months to five years. In addition, sellers of handguns were included in the permit system, as the government sought to regulate small arms’ sales in Canada. In addition to broadening the permit system, the government also introduced registration of small arms, requiring all persons to register their revolvers and pistols with the Royal Canadian Mounted Police (RCMP) or an agent designated by the Attorney General in each province. During the 1940s and 1950s, this basic system of gun control underwent only minor modification. In 1951, the federal government established a single small-arms registry under the Commissioner of the RCMP. Previously, registration was administered cooperatively between the (federal) RCMP and provincial authorities. At that time, automatic weapons were also formally included in the permit and registration systems. The foundations of Canada’s modern gun control regime came about during the 1960s and 1970s. These reforms involved a further tightening of gun control laws due, in part, to incidents of violent unrest in Quebec, and particularly the FLQ crisis. In 1969, the federal government introduced a system of categories, which involved different classes of firearms and a sliding scale of restrictions. The “prohibited” class concerned specific weapons and firearms which persons were banned or prohibited from owning and possessing. Originally, only silencers were included in this class of weapons. The second category, referred to as “regulated” weapons, included firearms that could be lawfully owned, but were subject to certain restrictions. Originally, this included handguns, fully automatic weapons, and short-barrelled rifles and shotguns. Persons were required to gain licences in order to purchase these firearms, and were required to register them with authorities. Finally, “unregulated” weapons included firearms that were lawful to own and which were not subject to any restrictions. This included long-barreled rifles and shotguns. In 1977, the government introduced a new permit, the Firearms Acquisition Certificate (FAC), to obtain long-barrelled rifles and shotguns that fell under the unregulated class. Originally, obtaining an FAC simply involved providing proof of identification and paying a fee. However, a new criminal offense was also introduced — for the unsafe storage of firearms. The federal government further introduced a series of modifications regarding ownership and use of regulated weapons. Persons could no longer cite the protection of property as a reason for acquiring a restricted firearm, and owners could no longer use their business address to register restricted firearms. While legislation introduced in the 1960s and 1970s set out Canada’s modern gun regime, the years that followed have seen numerous modifications. During the 1990s, the federal government strengthened Canada’s gun-control regime following the 1989 killing of 14 female students at l’École Polytechnique in Montreal. In 1991, the federal government expanded the list of prohibited weapons to include converted full automatic weapons, as well as a large number of semi-automatic military-style rifles and shotguns. Requirements to obtain a FAC were expanded; they necessitated that applicants provide a photograph and references, and included more stringent police screening and a mandatory 28-day waiting period. The government further required the successful completion of a firearms safety course, or test, to obtain a Firearms Acquisition Certificate. It’s important to note, however, that FAC safety training was only mandatory to purchase a firearm, but not to possess one. In 1995, the federal government passed the Firearms Act, which included several reforms further strengthening gun control regulations. Two key initiatives were integral to the new legislation. First, the government replaced the previous FAC with a new licencing system, referred to as a Possession and Acquisition Licence (PAL). Under this new system, a licence was now required to use and possess a firearm, not only for purchasing a gun. This broader licencing system also meant that safety training was required both to own and operate a firearm. The second key reform was the expansion of the registration system to include all firearms. Previously only restricted firearms, which included handguns, required registration. Under the new Act, unregulated firearms, such as long-barreled rifles and shotguns, also required registering. This provision has attracted both public and political criticism, and remains a high-profile issue. See the Canada‘s Gun Long-Gun Registration Program section of this article for more information on the history and operation of the long gun registry. See the Debates on Canada’s Gun Registry section of this article for arguments for and against the long gun registry. Other reforms of the 1995 Act included the banning of some short-barrelled and small-calibre handguns, and the introduction of a provision allowing the government to prohibit firearms not “reasonably” used in hunting. The latter was intended to provide the government with flexibility in limiting ownership and operation of semi-automatic military-style weapons. The Act further strengthened the screening process required to obtain a firearms licence, including a provision to notify current and former spouses (from the previous two-year period) of an individual’s intent to acquire a firearm licence. While spousal consent was not required for an individual to obtain a licence, a second review of the application would be triggered if a spouse, current or past, expressed a concern about the application. The purpose of this notification requirement was, and remains, to reduce the risk of domestic homicides. Five years for a first offence and seven years on a second or subsequent offence for eight specific offences involving the actual use of firearms (attempted murder, discharging a firearm with intent, sexual assault with a weapon, aggravated sexual assault, kidnapping, hostage taking, robbery and extortion); when the offence is gang-related; or if a restricted or prohibited firearm, such as a handgun, is used. Three years on a first offence and five years on a second or subsequent offence for other serious firearm-related offences (firearm trafficking, possession for the purpose of firearm trafficking, firearm smuggling and illegal possession of a restricted or prohibited firearm with ammunition). As discussed in the previous section, one of the more controversial elements of Canada’s gun-control regime is its long-gun registration program. Canadians have been required to register handguns since the 1930s. Registration of long-barrelled rifles and shotguns, however, was not introduced until 1995, amidst great public and political debate. The following section provides a brief history and overview of Canada’s long-barrelled gun registry. See the Debates on Canada’s Gun Registry section of this article for debates on the long-gun registry. The long-gun registry was introduced in 1995 by the government of Liberal Prime Minister Jean Chrétien. The registry was part of a broader set of gun control and anti-crime initiatives enacted through the 1995 Firearms Act. See the History of Gun Control in Canada section of this article for more information on the 1995 Firearms Act. A number of reasons are commonly cited for the federal government’s introduction of the long-gun registry. First, the gun registry was viewed as an important element of a broader government strategy to control firearm possession and violence. In introducing the 1995 Firearms Act, Allan Rock, justice minister at the time, argued the primary reason for stricter gun control was to ensure Canadians did not “want or need to possess a firearm for protection” and to prevent the deterioration of Canadian communities into “American-style war zones” (Mauser, 1998, p. 7). As such, the government faced pressure from a wide variety of groups to strengthen accountability for long-barrelled rifles and shotguns through registration. This included the Canadian Association of Chiefs of Police, the Canadian Public Health Association, the Canadian Bar Association, the Canadian Criminal Justice Association, the YWCA of Canada, and the Victims of Violence International (Coalition for Gun Control, 2010). The concern was that rifles and shotguns were more frequently recovered in crimes, and more often the cause of death, than handguns. Another reason cited for the introduction of the long-gun registry was more partisan in nature, and that the initiative was politically motivated to solidify Liberal electoral support (Mauser, 1998). This analysis suggests the governing Liberal Party pursued stronger gun control as a tactical strategy to solidify its support with a core constituency — namely, younger urban voters in Ontario and Quebec. The basic assumption is that gun control, including long-gun registration, was popular with this group of voters, as they were less likely to use firearms for hunting or recreation, and had greater concerns about public safety issues associated with any proliferation of guns in their communities. In introducing the new legislation, the Chrétien government faced strong political opposition. While the government was able to pass the gun registry in the House of Commons, three of the four opposition parties voted against the initiative: the Reform Party, the Progressive Conservative Party, and the New Democratic Party. (The Reform Party and the Progressive Conservatives eventually merged into the Conservative Party of Canada, which has sought to abolish the gun registry since forming government in 2006. See below for more information.) Before the vote, many Liberal MPs also expressed concerns over the gun registry, but eventually voted in support of their government and the prime minister. In the Senate, the Progressive Conservatives attempted to build a coalition to amend the legislation, but ultimately failed to garner sufficient support. Political opposition to the gun registry was not solely limited to Parliament. During Parliamentary hearings on the legislation, four provinces (Alberta, Saskatchewan, Manitoba, and Ontario) sent representatives to testify against the gun registry. The Government of Alberta eventually challenged the federal government’s ability to introduce the legislation, arguing that gun registration was an area of provincial jurisdiction. In 2000, the Supreme Court of Canada ruled on the issue in Reference Re. Firearms Act, concluding that the legislation was constitutional insofar as it fell within the federal government’s jurisdiction in the area of criminal law. The federal firearm registry is administered by the Canadian Firearms Program, a federal government program under the auspices of the Royal Canadian Mounted Police (RCMP). Formerly known as the Canada Firearms Centre (CFC), this agency was created in 1996 to implement and administer the 1995 Firearms Act. The CFC was originally a branch of the federal Department of Justice, with responsibility for licencing firearm owners; registering all firearms; coordinating with the RCMP, provincial police forces and the agency responsible for customs and national revenue; and coordinating with provincial Chief Firearms Officers. In recent years, the CFC has undergone a series of administrative changes. In 2003, the CFC was established as a standalone agency within Public Safety Canada, the federal department responsible for emergency management, national security, crime prevention, and law enforcement and corrections policy. Then, in 2006, the CFC and responsibility for the gun registries were transferred from Public Safety Canada to the RCMP for more effective coordination of gun-control activities (RCMP, 2008). Finally, in 2008, the CFC was merged with the RCMP’s Firearms Support Services Directorate, forming the Canadian Firearms Program (CFP). This program oversees the administration of the Firearms Act, including the registration of firearms, and provides firearms-related support to law enforcement agencies across Canada. The long-gun registry includes two key elements: the registration process and the information database. Under the Firearms Act, persons are required to register all firearms with the CFP, including long-barrelled rifles and shotguns. To register a firearm, individuals must first obtain a firearm licence, valid for the class of their firearm, and have the gun authenticated by an approved verifier. Once the licence has been obtained, and the weapon formally verified, individuals can register their firearm electronically or via a paper application. In cases where an already registered weapon is being sold or transferred, the new owner is obliged to contact the CFP to update the registration record. In registering a long-barrelled rifle or shotgun, owners are required to provide certain minimum information. They must provide their firearm licence number, as well as their first and last names. It’s important to note that in obtaining a firearm licence, individuals must further provide an approved photograph, their address, personal history, and marriage/common law status. In addition to personal information, gun owners must also provide a description of the rifle or shotgun they are registering. This includes the serial number, make and manufacturer, calibre, shot, barrel length and any distinguishing characteristics. This gun-related information is recorded by the approved verifier prior the registration application. This information is then entered into an electronic information database called the Canadian Firearm Information System (CFIS). CFIS links specific firearms and their owners, and includes their name, address, and personal history. This electronic database, in turn, may be accessed by law enforcement agencies, including the RCMP and local and provincial police services. Through the Canadian Firearm Registration On-line, police agencies may query the database in real time for the purposes of tracing firearms recovered in crimes, or to gain information (such as whether a firearm has been registered at a specific address) during an investigation or in dealing with incidents. As of 2009, over 7.3 million firearms had been registered (RCMP, December 2009). Since its inception, the long-gun registry has been the centre of political and public debate. As discussed above, three of the four opposition parties opposed the gun registry when it was introduced in 1995 (the Reform Party, the Progressive Conservative Party, and the New Democratic Party). Moreover, several provinces unsuccessfully challenged the federal government’s constitutional jurisdiction in being able to introduce the gun registry. Criticism of the long-gun registry has been further buttressed by its significant financial costs. When the Liberal government introduced the registry, it projected the cost of implementation would be approximately $120 million, most of which would be covered by the registration fees (CBC, November 2009). In 2002, however, a review by the Auditor General of Canada revealed the cost would reach over $1 billion, with registration fees only accounting for approximately $140 million (CBC, November 2009). By 2004, estimates of the total cost had doubled to approximately $2 billion (CBC, 2004). In 2006, the federal Conservative Party, was elected to a minority government. A key commitment of the new government, helmed by Stephen Harper, was the abolishment of the long-gun registry — though the Conservatives pledged to maintain registration for restricted firearms, such as handguns. Leaders of the opposition parties have since announced their support for maintaining the long-gun registry, however some individual opposition MPs have publicly stated they favour its abolishment. In 2006, the Government of Canada introduced a number of immediate measures, including a one-year amnesty for individuals who had not yet registered their non-restricted firearms (this amnesty has been extended in subsequent years). The government also announced that long-gun owners would no longer have to pay to register their firearms, and that those who had already registered their guns would be provided with refunds. Later that year, the government introduced legislation to abolish the long-gun registry altogether. However, the legislation failed to be passed before a prorogation of Parliament in September 2006. Since 2006, several more bills abolishing the long-gun registry have been introduced in Parliament. In 2007, Conservative MP Garry Breitkreuz introduced a private member’s bill to reform federal gun-control policies. Not only did the legislation provide for the elimination of the long-gun registry, but it also called for softening controls on automatic and semi-automatic weapons, allowing individuals to transport such firearms to public shooting ranges. However, the legislation died in 2009 after Breitkreuz failed to appear for the debate in the House of Commons. Afterwards, the MP announced he had allowed his bill to die so he could support a Conservative Party colleague’s private member’s bill (see below). In 2009, the Conservative government took the extraordinary step of introducing legislation — in the Canadian Senate — to eliminate the long-gun registry. (In most cases, government legislation is first introduced in the elected House of Commons.). The government cited the House’s heavy legislative agenda as the reason for introducing the bill in the Senate, though some observers viewed the move as strategic, allowing the Conservatives to blame Liberal-dominated Senate if the bill failed to pass (CBC, April 2009). As of February 2010, the government’s bill had stalled in the Senate. Also in 2009, a second private member’s bill to eliminate the long-gun registry was introduced in the House by Conservative MP Candice Hoeppner. Under this proposed legislation, individuals would no longer be required to register non-restricted firearms, such as long-barrelled rifles and shotguns. Individuals would, however, still be required to have a valid firearms licence and undergo a police background check and safety training to purchase or possess a long gun. Moreover, the legislation would maintain the registration of restricted firearms, such as handguns. In November 2009, the bill passed second reading in the House by a margin of 164 to 137, with several MPs from the NDP and Liberal parties voting in favour of the legislation. As of July 2010, the bill still awaited a final vote in the House, and passage in the Senate, prior to becoming law. Valuable instrument for law enforcement or an expensive, ineffective program? One of the central issues in Canadian gun-control policy is whether to abolish the long-gun registry. The issue is not whether the government should regulate gun ownership and possession generally. Nor does the Canadian debate centre on whether the gun registry should be eliminated altogether. Most opponents of the long-gun registry, (including the federal Conservative government), have supported tough licencing requirements in order to own and use rifles and shotguns, and have continued to support the registration of restricted firearms, such as handguns. The basic debate, instead, has really become about whether the registration of long-barrelled rifles and shotguns is a beneficial approach to gun control. It is interesting to note that public support for the long-gun registry is fairly evenly split, though attitudes differ significantly along key demographic and ideological lines. In a November 2009 EKOS poll, 38 percent of respondents supported abolishing the long-gun registry, while 31 percent supported maintaining the program (31 percent were undecided or did not have a response) (CBC, November 19, 2009). Supporters of the gun registry tended to be university educated, supporters of the Liberal or Bloc Québécois parties, or living in central Canada (particularly Quebec). Those opposed to the gun registry tended to be supporters of the Conservative Party, live in the Prairies, and aged 65 or older. A common argument in support of the long-gun registry is that it represents a valuable tool for law enforcement agencies (Coalition for Gun Control, 2009). A key tenet of this argument is the assertion that rifles and shotguns are often used in crimes and are an important cause of deaths. For example, between 1991 and 1995, and prior to the introduction of the long-gun registry, there were 1,082 firearm-related homicides in Canada. Of that total, 396 were committed with a long-barrelled rifle or shotgun, accounting for 37 percent of total firearm-related homicides (RCMP, 2002). The use of rifles and shotguns was particularly high in rural areas (populations of less than 100,000), where they accounted for 62 percent of all firearm-related homicides. This was in contrast to highly urban areas (populations of one million or more), where rifles and shotguns only accounted for 11 percent of all firearm-related homicides. *Percent of firearm homicides committed by a long-barrelled rifle or shotgun. Supporters argue the long-gun registry aids law enforcement officials in investigating gun-related crimes in that it allows agencies to trace recovered rifles and shotguns back to their owners. Moreover, this view holds that the gun registry enables law enforcement to identify whether a firearm may be present when dealing with potentially dangerous situations. For example, when responding to reports of robbery, assault, and domestic violence, police officers can query the registry in real time to determine if a particular individual owns a firearm or if a gun is registered to a particular premise. Numerous arguments are commonly offered by opponents of the long-gun registry. The first centres on the utility of registering rifles and shotguns for law enforcement agencies. Criminals, it is argued, will not register their firearms, making the registry useless in tracing weapons during police investigations. Another common argument suggests the gun registry penalizes the majority of long-gun owners, who are law-abiding citizens, by imposing bureaucratic procedures and fees on them, as well as making them vulnerable to criminal prosecution for failing to register their guns. This sort of argument was commonly cited by the Conservative government when it introduced the 2006 amnesty for individuals who had failed to register their long guns, in addition to committing to eliminate (and reimburse) registration fees to gun owners. See the Canada’s Long-Gun Registration Program section of this article for more information on recent moves to abolish the gun registry. A third type of argument suggests that alternative measures may be introduced to combat gun crime and violence, without imposing a long-gun registry. This includes a strict licencing system (with thorough background checks), tougher sentences for gun crimes, and strengthening control over the illegal smuggling of firearms into Canada. As Canada currently has these sorts of measures in place, this argument contends it is not necessary to further require individuals to register their rifles and shotguns. Finally, critics often point to the huge cost of the long-gun registry as a reason for its elimination. As discussed above, the Liberal government originally estimated the cost of implementing the registry at approximately $120 million, with most of the costs being covered by registration fees. Subsequent reviews, however, have shown the actual cost to be closer to $2 billion. Consequently, critics argue the long-gun registry is an extremely costly and ineffectual means of controlling firearms in Canada. See the Canada’s Long-Gun Registration Program section of this article for more information on the cost of the long gun registry. Mauser, G. “Canadian Firearms Centre (CFC)” in Guns in American Society: An Encyclopedia of History, Politics, Culture and Law: Vol. 2. Edited by Gregg Lee Carter. California: ABC-CLIO, 2002. Wilson, H. “Guns, Gun Control, and Elections: The Politics and Policy of Firearms” Oxford: Rowman & Littlefield Publishers, 2007. 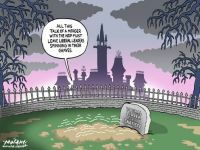 Akin, D. “Conservative MP’s Bid to Abolish Gun Registry Fails.” National Post. Published: Monday, May 25, 2009. Is it Time to Abandon the Gun Registry?